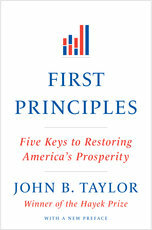 ← What Does Anti-Keynesian Mean? Today the CBO released its updated score of the Boehner budget proposal and the Reid budget proposal. So we can now do an apples-to-apples comparison of the year-by-year numbers in the two plans, and thereby get a better understanding of the differences between the two. A couple of charts will help. The first chart shows the impact of the Boehner proposal on federal discretionary outlays. Compared to the March CBO baseline it reduces discretionary outlays by $756 billion over 10 years, which, with interest saving of $156 billion and other smaller changes, reduces the deficit by $917 billion. That is of course a lot less than the $6 trillion in the House budget resolution, but it is a good step in the right direction. The proposal correspondingly increases the debt limit on a nearly dollar-for-dollar basis by $900 billion, which should take us into early 2012. Since this increase will not last through the upcoming presidential election, the proposal also enacts a process to increase the debt limit by another $1.6 trillion with matching spending cuts, which would then last through the end of 2012. 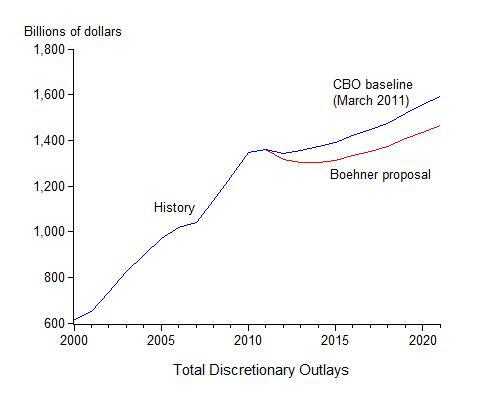 As the chart shows the Boehner plan gets started reducing discretionary outlays in 2012 (by $25 billion) and again in 2013 and then remains well below the baseline. The chart also raises doubts about claims like the New York Times editorial page made yesterday saying that the Boehner plan “would eviscerate discretionary programs.” That is not what the CBO numbers show. If you look at the graph you can see that with the Boehner plan discretionary spending remains far above the levels of only 5 years ago: In 2012 the level of outlays is 27% above 2007, just before the financial crisis—another indication that there is more work to do following this step. The second chart shows the Reid proposal, which also places caps on discretionary spending. Two lines are needed to explain how the Reid proposal works. The upper Reid line shows the caps on spending excluding Iraq and Afghanistan; this line is nearly the same as the Boehner line in the first graph; it saves $751 billion over 10 years. The lower Reid line shows that by also capping outlays for Iraq and Afghanistan, well below current CBO baseline for those operations, the Reid plan can be scored as cutting more from outlays than the Boehner plan. However, the CBO baseline for Iraq and Afghanistan simply extrapolates existing budget authority for these operations; it is by no means a forecast of future spending; rather it is an overestimate given current stated policy of the Administration and others regarding Iraq and Afghanistan. But by capping spending below this overestimate of spending and then counting the difference as budget saving, the Reid plan overstates budget saving. 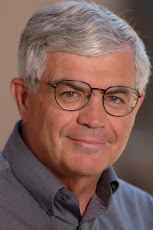 It is in this sense that critics say that the Reid proposal is based on gimmicks. And the amount is large; by capping spending in this way the Reid plan brings deficit reduction up to $2.2 trillion over 10 years, thereby justifying a larger increase in the debt limit which goes past the 2012 election. If the Reid proposal removed this second type of cap it would be very close to the Boehner proposal. And this suggests–assuming that the House votes to pass the Boehner plan tomorrow–that the Senate could vote to approve the Boehner plan or something close to it, perhaps with some compromise about how to treat Iraq and Afghanistan spending projections going forward. Like the Boehner proposal, the Reid proposal avoids a tax increase. Following the ‘Boehner principle,” the Reid proposal ties the debt limit increase to reductions in spending growth in roughly dollar for dollar fashion; it is not a “clean” debt limit increase. 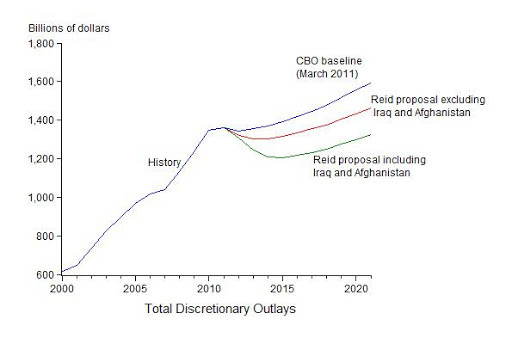 And the Reid plan caps discretionary spending excluding Iraq and Afghanistan at the same level as the Boehner plan. In all these ways the Senate has moved dramatically toward the House in the last few weeks, and dramatically away from the White House, which this year has called for tax increases, a “clean” debt limit hike untied to spending, and no cuts to spending relative to baseline.